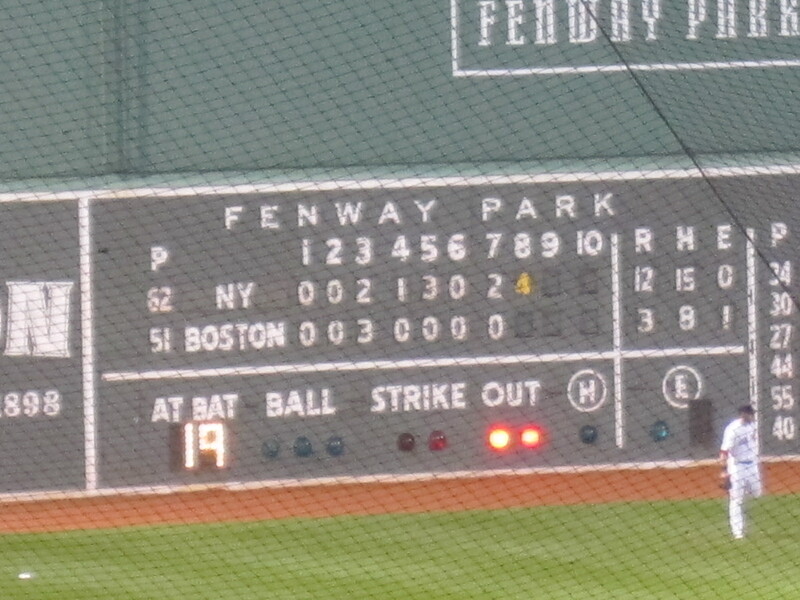 The Yankees crushed the Red Sox today. The score was 14-3 and the game lasted about 5 hours (i.e. with an hour rain delay). 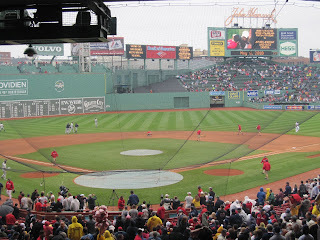 I'd been to Fenway before, so there wasn't anything I really wanted to check out. I went to take a picture of the Ted Williams statue, but after that it was all business. 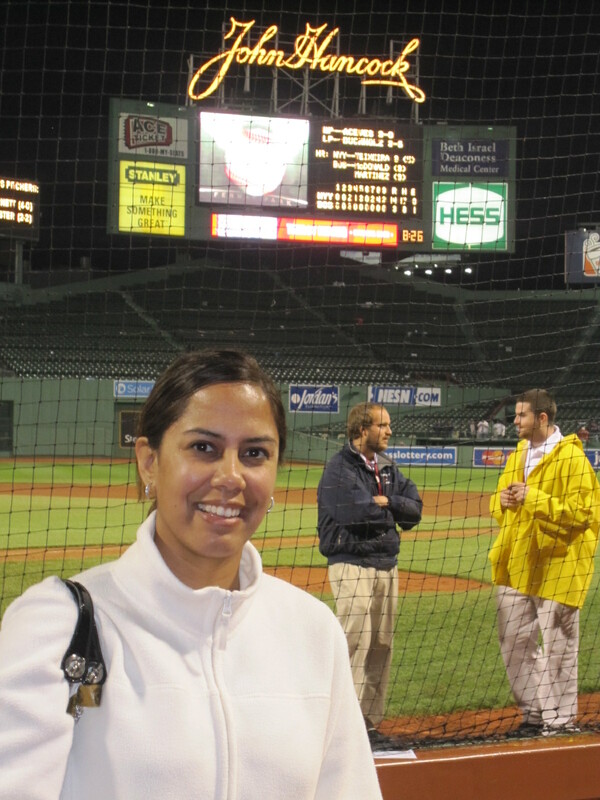 I took Ning with me to the game, since she's kind enough to host me in Boston this weekend and I was pleased to see that the seats we had were under cover. 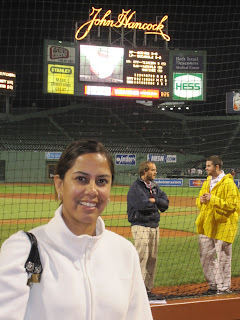 **** Ironically, the seats were in the same section as my crush of many years ~ WEIRD, but I digress... 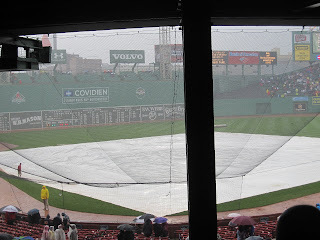 It'd been raining all morning and I was almost certain that there would be a rain delay. I was right. 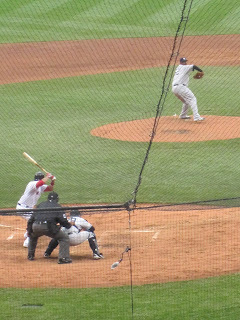 In the 5th inning, one strike short of an official game, the rain started comng down. **** Incidentally all the songs that were played suddenly had a rain theme (e.g. Here Comes the Rain Again, etc.). I had no idea there were so many of them. Eventually the game resumed. 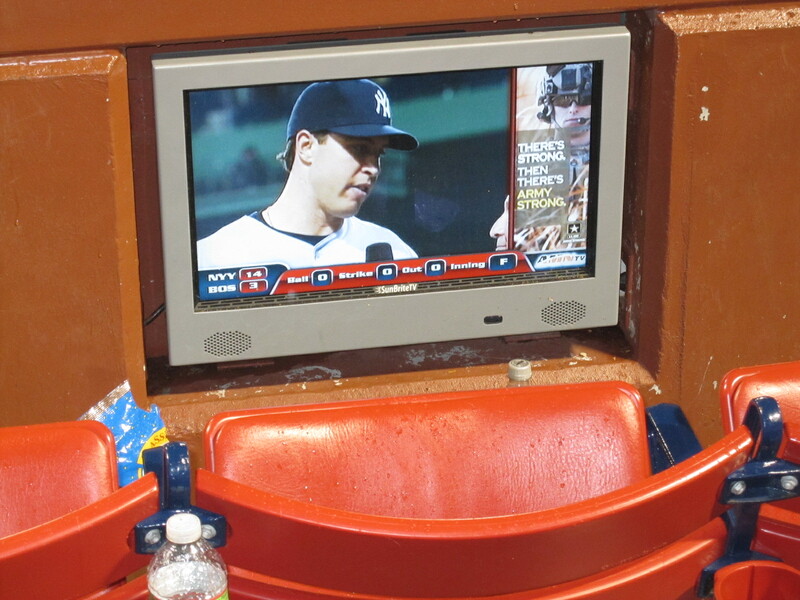 Whoever said that the Yankees and Red Sox games take a long time to play wasn't kidding. 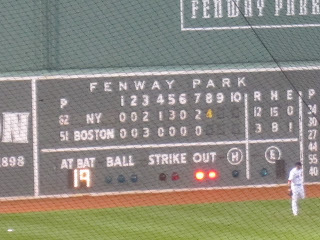 This game was a marathon, but was exciting especially if you are a Yankees fan. The game got away from the Red Sox and before you knew it, the Red Sox fans were leaving Fenway Park. Of course I ate at the game. 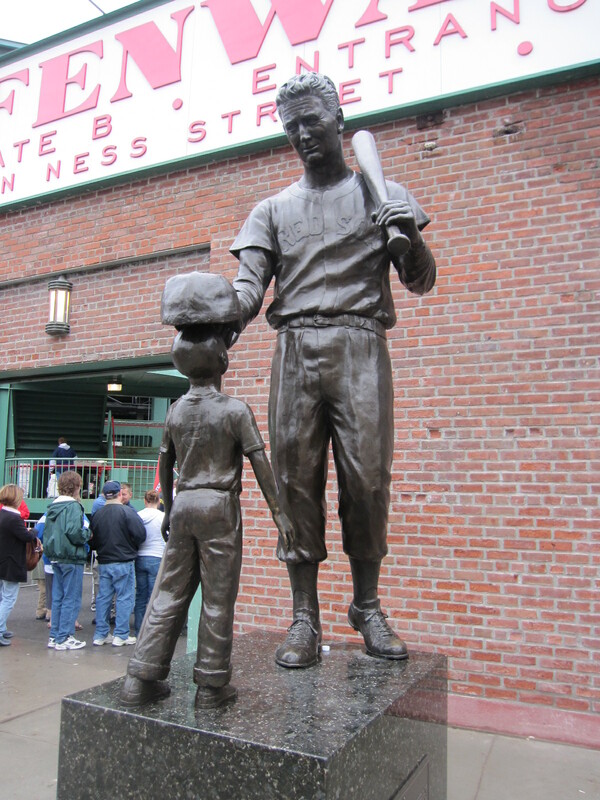 I had a Fenway Frank, and it was good. I was pleased that the hotdog was longer than the bread, since it's a pet peeve of mine when there is too much bread. The bread was like a slice of white bread, and it tasted the same way. Simple (i.e. which is good). I also enjoyed a slice of pizza from Paga Gino's, and the crust was nice and crispy. With the game lasting as long as it did, I needed to eat! 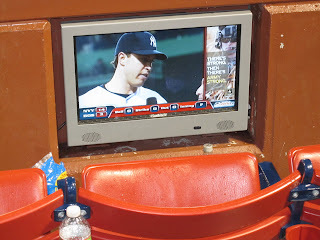 **** I was pleased to see that Fenway Park serves Legal Seafood clam chowder. I didn't have any, but it is a favorite of mine. One more thing, and I don't know why I didn't think of this earlier, because it's obvious. Tonight I noticed a mother/son, old lady/younger man combo in the stands and they were wearing designated driver wristbands. Also, they were drinking sodas. The lightbulb in my head clicked on! When I showed the awkward "couple" to my friend the following converstion ensued. Ning: How do you get the wristbands? OK. So that was a little mean, but it is funny. In all seriousness, if you sign up to be a designated driver at most stadiums/arenas/ballparks for your group you get a free soda. So, if you're trying to save a few bucks ~ there you go.